Hi, I'm Peter J Hopkins. Welcome to Gravel Studios, where you'll find information about my compositions and arrangements. I write music in a variety of styles and genres, including concert band, marching band, orchestra, choir, and musical theater. I have extensive experience with school, church, and community groups, and hope you'll find something of mine that's appropriate for your ensemble. I'm also currently accepting commissions for new works. If you have any questions or comments, please feel free to contact me. Dabadace is a new social networking site that I am working on. It's a work in progress, so check it out, and give me feedback! Get It! 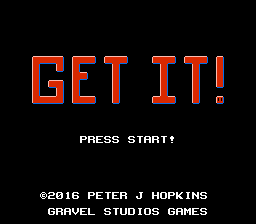 is a new homebrew NES game that I designed and programmed. Get It! Got It? Good. If you haven't checked out the Gravel Studios YouTube Channel, you should. It has all kinds of stuff that you won't find anywhere else! Shipping and sales tax are included in all prices. Orders shipped via USPS first class mail. Click the links below to see, hear, and buy music for specific ensembles. There's even more stuff by Peter J Hopkins on YouTube! Click here to visit the Gravel Studios YouTube Channel.